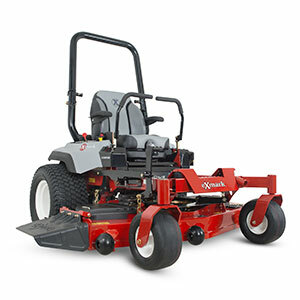 Exmark released its new Radius zero-turn mower. The Radius is available in three models: E-Series, S-Series and X-Series. Each features a unibody frame that’s fully welded of 2-inch by 3-inch rectangular steel frame tubes for maximum strength and durability. The frame design places the heaviest components, including the engine, fuel tank and hydro drive system, lower in the frame for improved weight balance and increased stability, traction and maneuverability, Exmark said. Radius S-Series models feature operator seats equipped with Exmark’s adjustable isolation technology, while Radius X-Series machines are equipped with the company’s full-suspension seat. Both seats use specialized foam design and Elastomeric Vibration Control material to significantly increase comfort by reducing bumps and vibration felt by the operator. Exmark designed the Radius with Lazer Z-style deck strut isolation technology, which eliminates deck sway, offers smooth deck height adjustment and delivers increased durability with reduced maintenance, the company said. The isolation technology also increases operator comfort by reducing the vibration felt through the Radius chassis. Exmark’s integrated hydro transmissions and maintenance-free sealed bearing blade spindle assemblies further reduce maintenance requirements and increase the commercial durability of Radius models. There are four grease points on the entire machine. Belts are easy to access without tools and engines are equipped with oil drain hoses for clean and easy oil changes. An integrated jack receiver is welded to the Radius frame to ease access to the underside of the Radius deck and chassis when equipped with Exmark’s jack accessory, available separately. Radius X-Series models use a Kawasaki FX engine powering a high-capacity hydro drive system to achieve forward speeds of up to 10 mph. Radius S-Series machines feature Kohler ZT Confidant engines, with ground speeds of up to 9 mph. Both models feature heavy-duty canister-style air filtration systems. Radius E-Series machines are powered by the Exmark 708cc V-Twin engine and integrated Hydro-Gear transmission, for speeds of up to 8 mph. Additional Radius features include a digital hour meter, a window-style fuel gauge, a 12-volt power port, integrated hitch and a roll-over protection system.